Perhaps one of the finest fillies ever from Sunny Days. Very feminine type, with the long legs and beautiful “R-line” head from her mother SPS Rothara, with a nicely muscled, uphill frame from Altpremiumhengst Oldenburg sire Diamond Hit — a Champion in both sport and breeding, whose story includes one highlight after another. This charming filly shows sparkle, presence and sociability, and has inherited the good gaits with which both her parents are blessed. 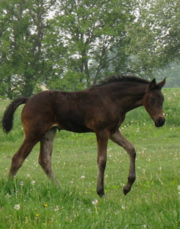 She is pictured here as a foal, and at 3 years of age, successfully completing her MPT. SOLD to Shannon as a suckling, Daisy is now in Nova Scotia, and mother of a beautiful 1st foal.